Painting away the winter blues. In case you missed it, it’s stiiiiill winter here in the Northeast! There have been a few sunny days since our last beating of snow. But, it is still very cold and hard to get outside with the kids. Moms in my circle are longing for the days we can meet at a park and let our kids run free, and not have to mess with layers and layers of winter clothes. Come on Spring! To keep my girls busy (and to keep our sanity) we are visiting different libraries to take advantage of a variety of free programs. From story time to crafts to music and movement classes and so much more. This week we traveled to two new libraries. While at one story hour we discovered the Le Petite Picasso painter program offered each week. The mere mention of paint (and opportunity to make a mess) and my kids are all over it. We came back the very next day for our Picasso experience! This little library has such a warm and colorful space for kids to play and create. 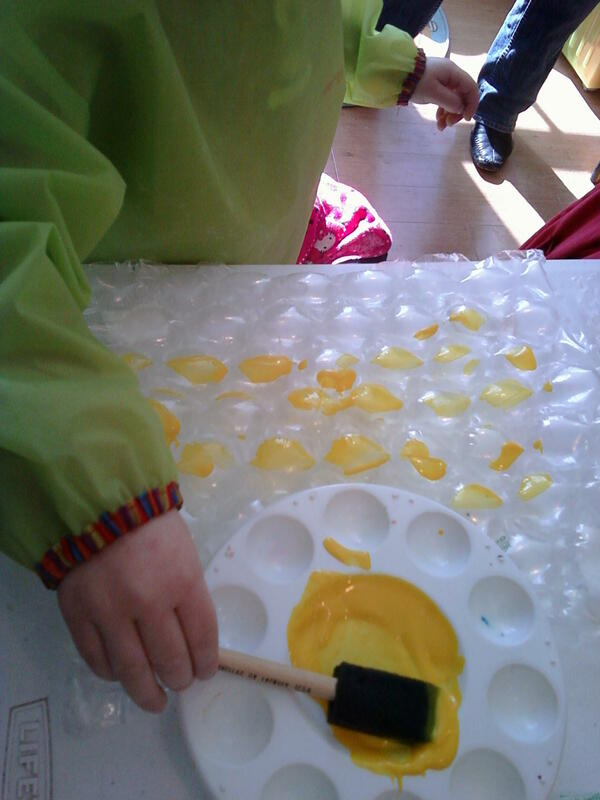 We donned our painting smocks and were ready to paint … bubble wrap! Who doesn’t love bubble wrap?! Sunny yellow on a winter’s day. Of course they used their hands to mix the paints and pop the bubbles. It’s all a great sensory learning experience, and just plain fun! Different sized bubbles offered variety of texture. Once the kids had a chance to play with the paints for a bit, the librarian leading the class placed plain paper over the top of the bubbles. The children pressed down on the paper and rubbed their hands over it. Pealing the paper back revealed a unique print. Taking advantage of programs at different libraries is a great way for us to get out of the house on a cold day, make a mess that someone else cleans up and we make some new friends- all for free! 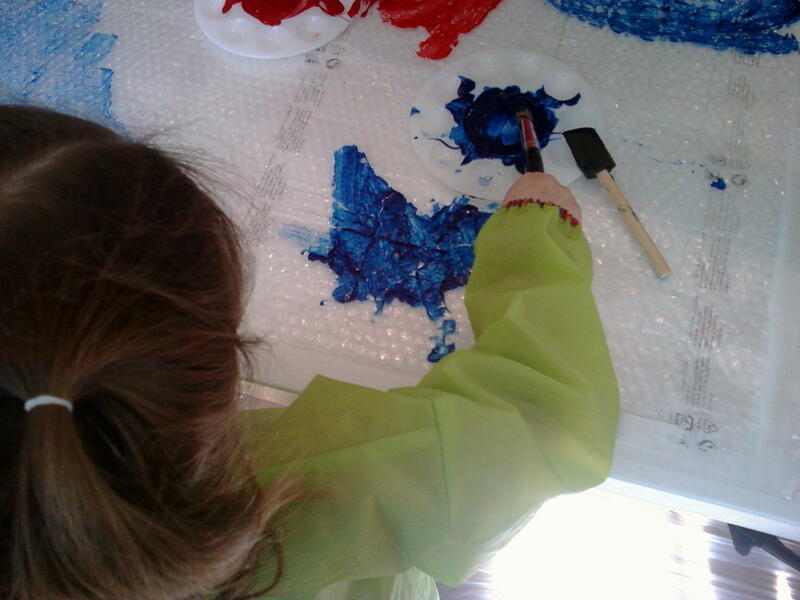 Paying for two kids to attend painting class, or private lessons is costly. Attending painting class at the library for free is a huge savings for us! This is such a simple activity to do at home with your kids. 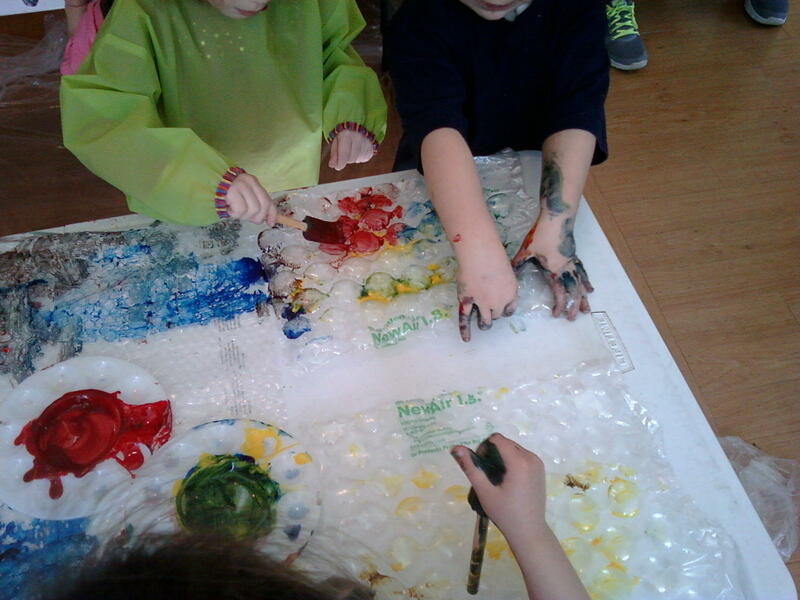 All you need is a roll of bubble wrap, some plastic on the floor, paints and brushes. If you have those cute little painter pallets great- if not, just dump the paint right onto the wrap and let your kids go. Does painting at home make you nervous? If you’re embracing the whatever philosophy you’ve already wrapped your kid in plastic, moved away all the furniture and have plenty of wipes on hand! This of course is to alleviate our own stress by attempting to contain the mess. The beauty of this project is when the kids are finished you can roll it all up and toss it in the trash. If you want more Eco-friendly put paper on the floor and recycle. Tip: I rarely pay for paper for my kids to paint on. I save the paper that comes in shipping boxes. I just fold it neatly and lay it flat. Now I have paper any time we need it for painting, crafting, or to use as underlay to keep a project area neat. What are some ways you save on art/craft supplies for your kids? Does your library offer any fun, free programs? Comments Off on Painting away the winter blues. « A Look Ahead to Spring- Let’s Get Messy! 0 comments on Painting away the winter blues.